This is the thank you note I sent to the many, many people who generously supported my Amelia Island JDRF Ride. What a journey. 700 Riders. 154 with T1D. 3 Million dollars raised! WE DID IT! 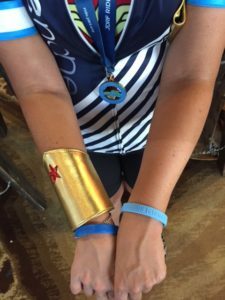 Saturday’s 104 mile JDRF cycling goal is in the books, but there’s a behind-the-scenes story too. The weekend’s adventure started on the flight. I was on a plane with a bunch of fellow JDRF cyclists but was startled to hear someone saying my name and grabbing my arm, only to find one of my teammates and the only other one who’s had T1D as long as I have, with a crashing and dangerously low blood glucose level. Things got a bit frantic but we pulled together, got him quick carbs and we all worked together. My fundraising theme this year was Type ONEder Woman and my bike was covered in the names of all my amazing donors, Wonder Woman stickers, glitter and stars. What you may not have known, was last winter I had the honor to address 700 people on behalf of JDRF in New England. 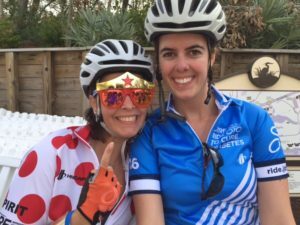 I shared my experience in clinical trials to improve the treatments of T1D AND I shared my JDRF Ride story (from Burlington to Tucson). I met so many amazing people that day, but one truly stood out, a little girl named Emma and her Mom. Emma was decorated with Wonder Woman facepaint (her favorite) and we talked about our mutual Wonder Woman love (who doesn’t love Wonder Woman?). 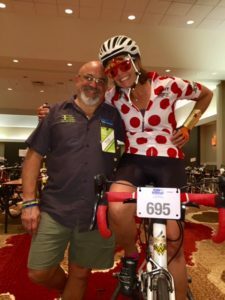 Her father is even a fellow JDRF cyclist! 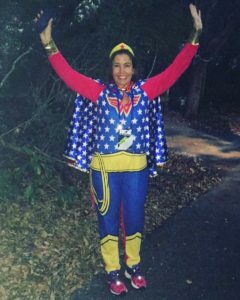 Throughout the training season, I donned a Wonder Woman sports bra peaking out of my ride jersey. Slowly a theme evolved, Type ONEder Woman and this little girl and her family, constantly liking my training photos, fundraising pushes and cheering me onward. 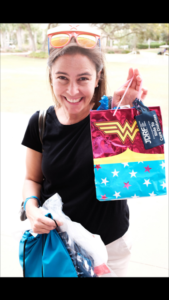 When I arrived at the hotel, I was handed a Wonder Woman gift bag filled with Wonder Woman goodies (the tiara fit perfectly) and the most adorable card, again cheering me on (Thanks Emma’s family). In a matter of hours, I managed to drop a vial of Novolog insulin in our hotel room (sorry Paige, insulin smells disgusting) and then to my complete HORROR, at dinner, my insulin pump DIED (what?!?!?)! I was so fortunate to discover I had a backup pump and supplies in my luggage, but I was reminded of two things: Bad things happen in threes (friend emergency on flight, wasted insulin, pump death) AND the incredible power of teamwork. In all of these scenarios, my teammates offered to help and share all THEIR own supplies. And that’s exactly how ride day went. For the first time in my ride experience, the NYC team stayed together, and we worked as a team. We rode the same speed to keep ourselves all together. We laughed at the same ride hilarity. We helped one another out. We were truly a team. Since the route had multiple distance options and looped back to the hotel, we were able to say goodbye to our friends who rode shorter routes and they were able to cheer us on as the last group made the extra 25 miles to get us to the 104 mile mark. Whew! At the 76 mile mark, I had shooting pain in my frozen shoulder (they should call it stabbing pain shoulder, not frozen) and my right hand was constantly going numb. I had the opportunity to call it day. I looked down at my bike, and the first name I saw was Emma’s, so I hopped back on my bike (I didn’t hop, it was more like a careful climb), stuck with my team and kept pedaling. From mile 101 to 102, I had a rather cathartic moment, I was looking at Emma’s name and then the names of my nieces and nephews and then my sister Paige, who was right there, pedalling along with me. I kept thinking about Emma, and what my life was like growing up with T1D. It sounds dramatic (who me?) but it was like watching a montage of my life, like a scene in a movie. My childhood was directed by the advice given to my parents at my diagnosis, I was a child FIRST and a diabetic second. I did everything, played every sport, never missed out, but I remember quite vividly when I was the only girl in my class not invited to a birthday party because the birthday girl’s mother told her I was going to die (nope, still standing), or being on a date with a guy who freaked out that I had an insulin pump because I was “sick” and had “fooled him” into thinking I was healthy (ah the old bait and switch of perfection, oy), or the hours I have spent arguing with health insurance companies about the tools I need to take care of myself. 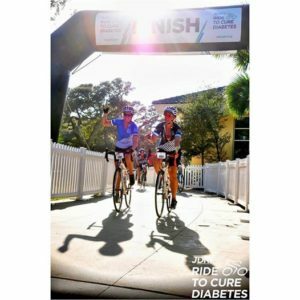 And the rest of that mile I focused on the fact that I was on a historic bike ride for JDRF, my T1D buddies, and myself as this ride raised an epic 3 million dollars to ensure a better future for everyone with T1D. At mile 103, we lined up as a team, and waited to cross the finish line ALL TOGETHER. In that moment of waiting, I saw my friend’s name, the one with the emergency on the plane. He’s got two adorable kids (who were at the ride), a fantastic wife (who rode) and he’s an accomplished cyclist (unlike my scattered cycling skills) and we are in the 37 years with T1D club, together. 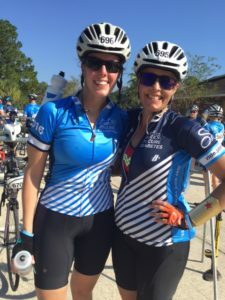 As I then told my ride mates, we are so lucky because so many people will never know what it feels like to accomplish a goal in an endurance sport and even luckier, because so many of the people with T1D prior to us, never got to see this point in life. I am grateful but I’m on a mission to change the future of this disease. And then I got to do something I have dreamed of for the past 2 years, I crossed the finish line, side-by-side, with my biggest fan, my sister Paige. Needless to say, no beer has ever tasted as good as the ones waiting for us when got off our bikes! I thank you with all my heart and busted pancreas for supporting me and inspiring my dream.